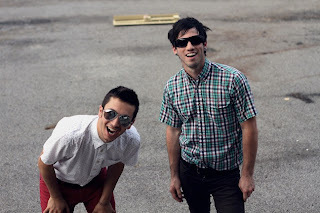 Video: Twenty One Pilots - "Guns for Hands"
The schizoid pop music from Ohio band Twenty One Pilots is back with the new video for "Guns for Hands." The duo has impressed me since I randomly watched them open up for Circa Survive back in November and was blown away by their live show. The video just focuses on the quirkiness and talents of the duo as they rock out to the song with masks and eventually duct tape their heads. Even in their video they bring that raw intensity that I saw during their live set. If you dig this, then certainly pick up their debut record Vessels via Fueled By Ramen.